Please share your March creations here. We all need to feel the love, so please comment on others' work either in this thread or in the Gallery. Feel free to calculate your points for each creation as you share it, but be sure to keep a running total of your points in the Teams, Rules, and Calculation thread. gmcwife1, beautiful dog! So cute that he likes lap time. gmcwife1 , beautiful dog! So cute that he likes lap time. gmcwife1 The floofiest marshmallow that ever floofed! Love how you kept it simple and monochromatic to match your pooch with just the addition of a pop of red with the hearts. Finally got around to doing some proper documenting this year. It's a miracle, praise the Flying Spaghetti Monster! sleepingbooty, beautiful. Love the soft colors and use of white space. The design has a very dynamic feel, with different colors it would be very dramatic and with your color it’s very elegant and classic. I’m totally going to have to try to copy this. I couldn’t sleep last night and watched some PL videos. Then got up and added some embellishments It just seemed so plain! I like it much better now! LisaDV Aww, thanks. I must confess I have "boring" colour and pattern choices (but I love them). Scrapping is sparking joy this weekend! I put together a page with the shows that kept me going through February while sat in front of Netflix, of course. I might edit this LO to add a title when I find something that works. Digital 12x12 LO: "Fave series 02/19"
sleepingbooty I love both of your layouts!! The first is so clean and beautiful. The second is such a great idea and I love the design! Don’t mind the typo, I finally got the link to work and don’t want to mess it up It should say, Ryder’s first run! gmcwife1 - Ryder is gorgeous! Is he a Samoyed? I love your pages - the red heart is perfect for the lap dog pages and I love the pale green accents on the run page. sleepingbooty - your garden page is perfect - simple colours and patterns let your photos shine! Is French your first language? Does it bother you that so many scrapbook supplies are in English? 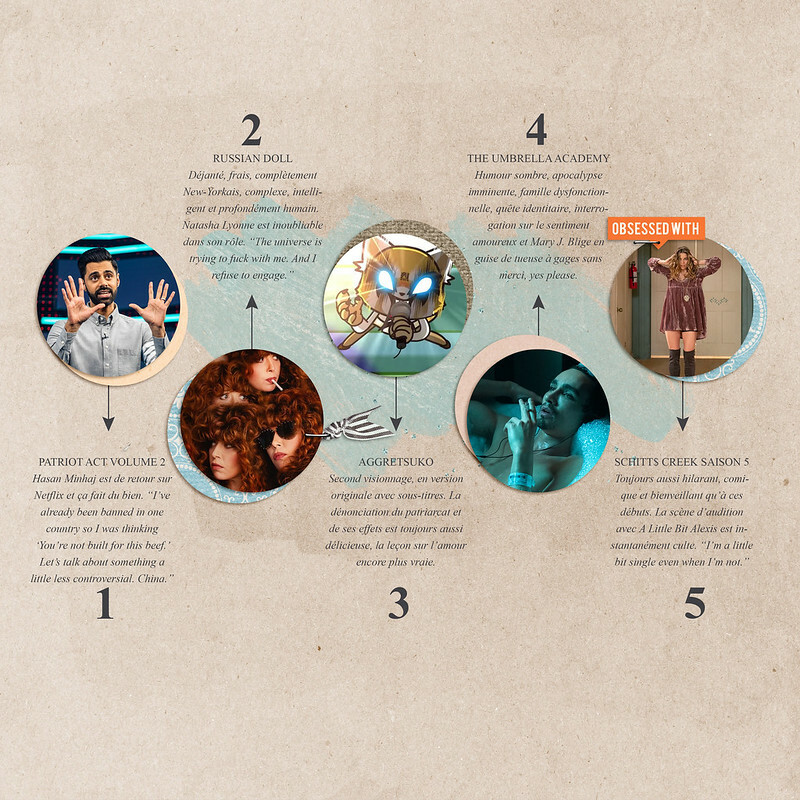 I love the circles on your Netflix page - great idea to document that! Stunning page sleepingbooty, love all the white space, the photos really shine! Oh, you mean the CORRECT way? What other way is there??? And holy crap, I LOVE LOVE your second layout. It looks like something from a design magazine. I am totally going to copy that! gmcwife1 I can't see your LO, when I click on the link it says "Photo no longer available." I wanna see Ryder!! I thought so - my Granny had a Samoyed when I was small - she was a well loved and spoiled dog - and beautiful! I am bound and determined to keep track of points AS I GO this month! It is a fun sucker for me when I have to do all of them at once at the end of the month. Y'all keep me accountable ok? LOL! crystalb Such fun and fresh colours! I love the library card layers in both of your book LOs. Those Pink Paislee alpha stickers look super cute and are just the right size on the pages you used them on. 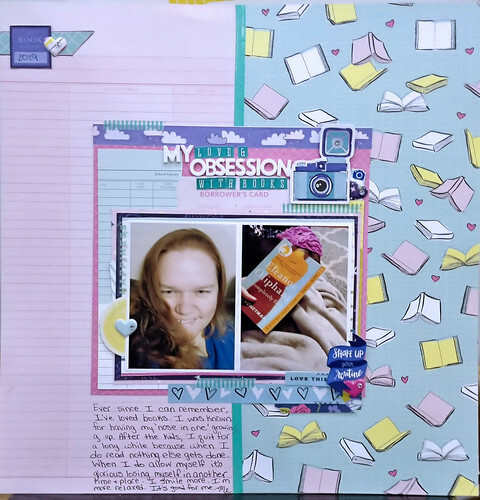 Love the half'n'half design on your Love & Obsession With Books LO. The pastel-coloured papers were a great choice and suit your complexion great! Great use of white space to let your photos breathe. crystalb - I love the book LOs - as a fellow bookworm, they warm my heart! 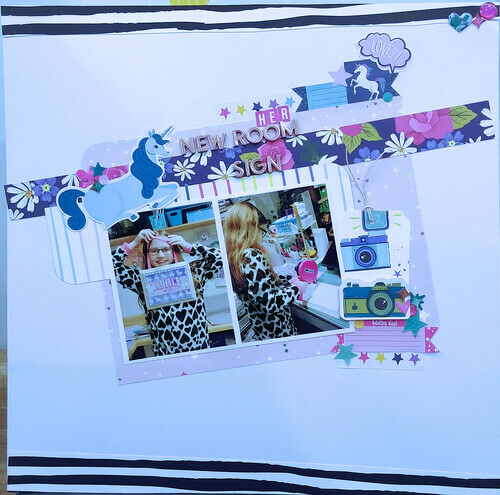 The name sign LO is so fun with the unicorns and purples and the diagonal tilt! Had the opportunity to squeeze in one layout tonight - photos from April 2006 - there are a few gaps in my 2006 album I'm trying to fill. 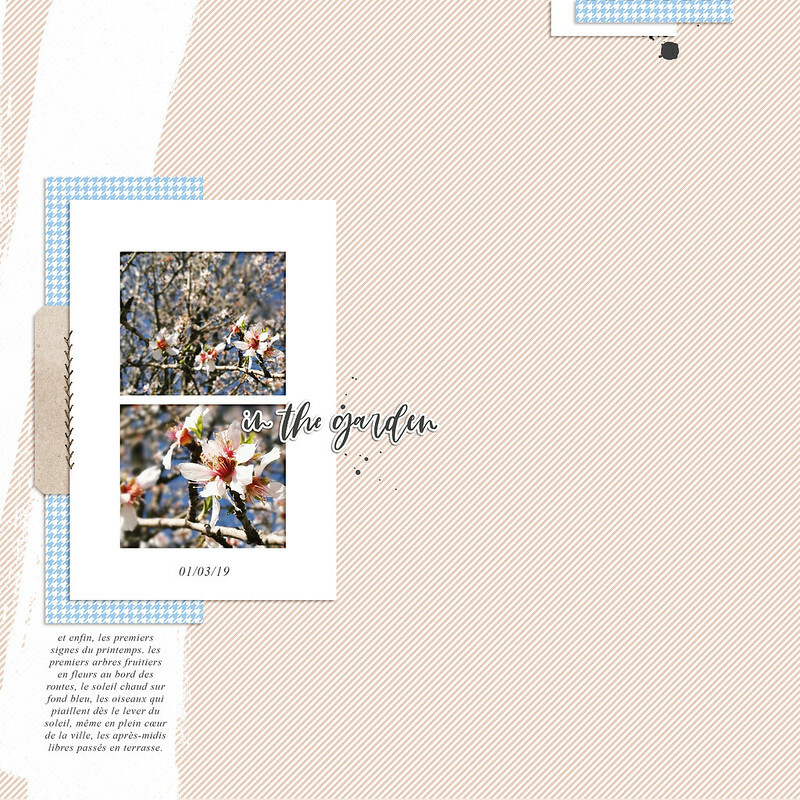 sleepingbooty - fab layouts: the spring layout is soft and lovely; the TV shows is a great idea and I love the design with the circular photos (glad you like some of the ones I like too! ); and your disney page is clean and so well grounded. crystalb - wonderful use of designs. I love the diagonal on the ombre with "curly or straight"; I love the half/half page with "obsession" and I love the directionality and layers on "read"! This is the page I scraplifted...found it on Pinterest. KelleeM - you look fab! Gorgeous layout - love the blues and the layering/clusters and the sprinkles! gmcwife1 I can’t see your layout any longer but love your dog! Great pocket page! sleepingbooty Absolutely gorgeous digi layouts! Your garden page is a true and perfect example of less is more! The series layout looks like it’s a professional magazine spread. I love the Disney page! 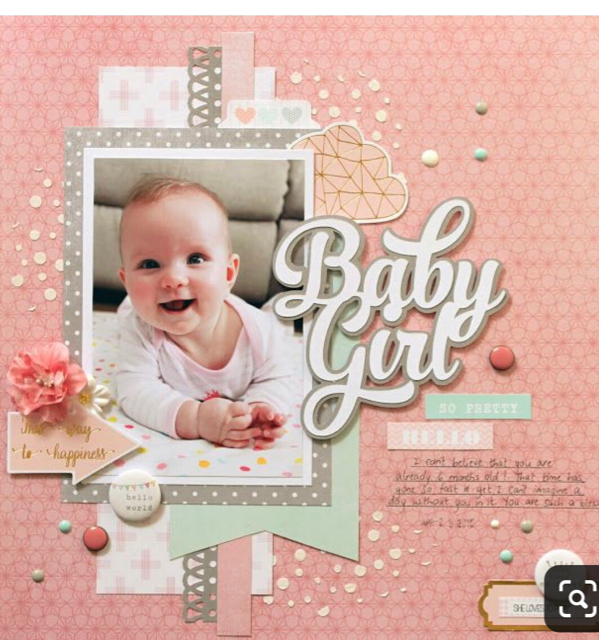 crystalb gorgeous pages...your layering, colorss, clusters and titles are all perfect! I love that you scrapped pictures of yourself too...I have the straight or curly battle with myself!! Linda love your colorful carnival pages and the patterned paper on your Easter page is awesome! Linda Yes, ALL carnivals count! 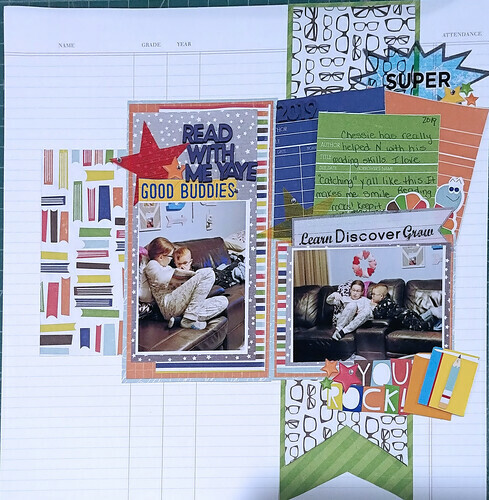 Love how you keep it simple with papers and embellishments but make it so fun. The different ways you matted your (many! 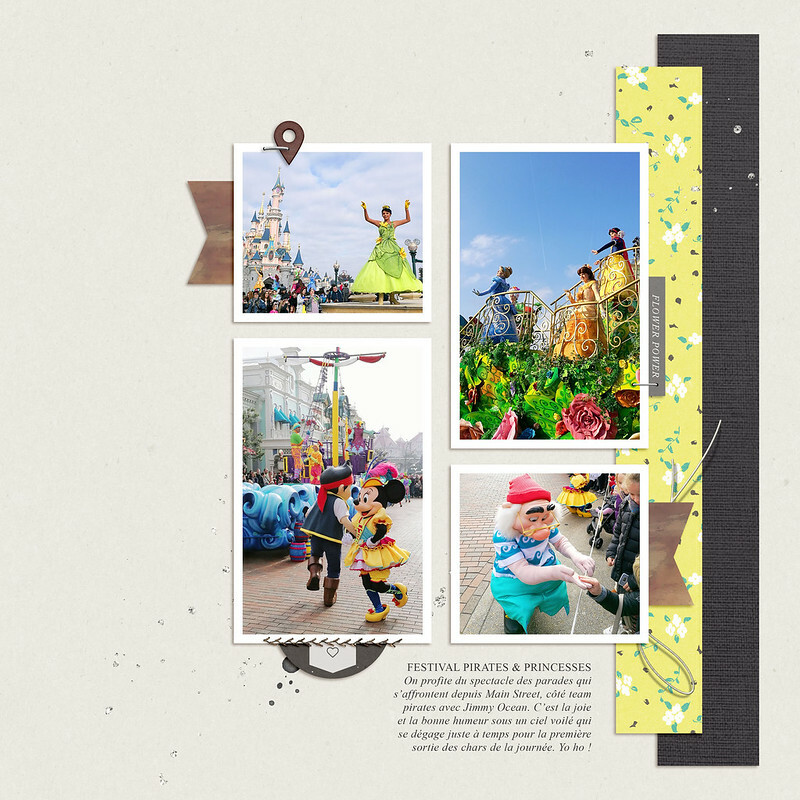 #impressive) photos on your Carnival layout makes your double page so dynamic. And what a cute carnival embellishment! My scrappy heart melted a little when I noticed the chocolate bunny placement on your Easter LO: it looks like the bunny is looking at the person decorating eggs in the bottom photo, aww! That's an adorable pattern paper, by the way. Also, looks like I didn't answer your previous question regarding my first language: yes, French is my mother tongue. I used to be annoyed at how few scrap goodies were translated in other main languages (especially since loads of French and Spanish-speaking people scrap) but I've grown used to having bilingual pages. English is present in my daily life anyway so it doesn't bother me that much that I have both languages overlapping to tell the story. PS: I don't think you're counting any of grammadee 's bingo card points for your LOs! Go grab those extra points, guuurl. KelleeM Oh, what a lovely page! 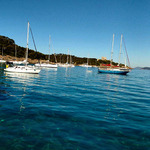 Beautiful photo and great reproduction of the beach theme on your LO. The gold and blue droplets are so dreamy and remind me of the reflections of the sunlight on the water. 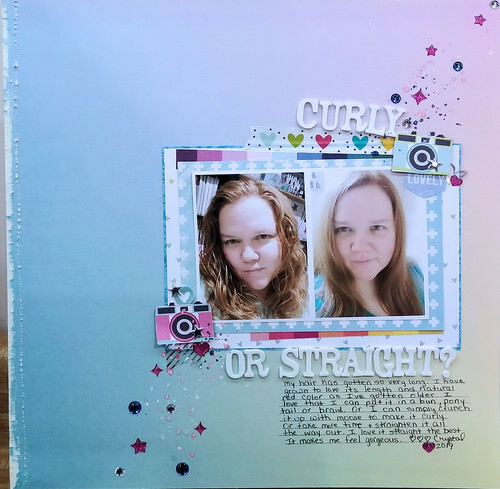 *heart eyes* I love how you embraced different shades of blue as the main colour elements of your page: it complements your hair so beautifully! To everyone who's commented on my pages posted so far: thank you so much. It's my first proper dip into the digital LO world (and first 12x12 pages). I've used digi before but mostly for PL, not for actual layouts. Heartwarming to read I'm not screwing up too much. I was planning on breaking away from the taupe-y background colours for my next LO but then today happened and I found out one of my teenage years musical legends had committed suicide. He was too much of a punk to pay hommage to him with florals or pink. Title refers to the messy life he lived (he talked openly about struggling with addiction and sobriety, depression and suicidal thoughts over the years) since there are not a lot of scrap sentiments that deal with the in memoriam theme/death. Digital 12x12 LO: "Keith Flint"